Capsule successfully launched into orbit, says Roscomos. Baikonur cosmodrome (Kazakhstan): A Russian-made Soyuz rocket blasted a three-man crew into orbit on Monday, beginning the first manned voyage to the International Space Station since a mission in October was aborted in midair because of a rocket malfunction. 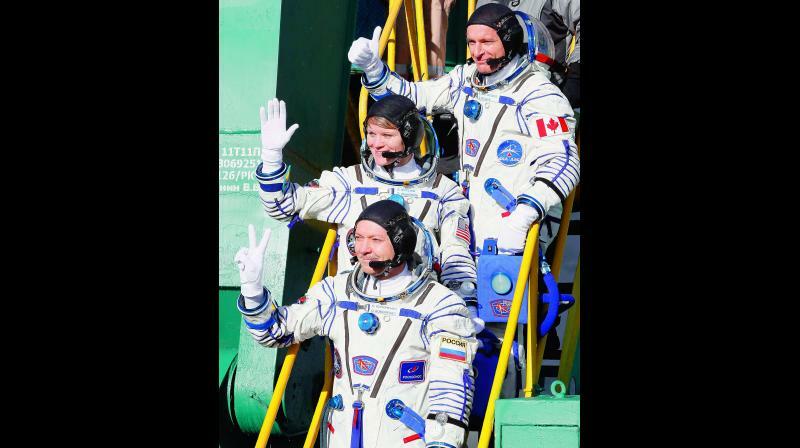 The Soyuz lifted off at 1131 GMT from Baikonur cosmodrome in Kazakhstan, carrying Russian cosmonaut Oleg Kononenko, NASA astronaut Anne McClain and the Canadian Space Agency’s David Saint-Jacques. “We have confirmation of the spacecraft separation; Soyuz capsule and crew safely in orbit,” NASA TV said online in its blow-by-blow commentary of the take-off. The launch was closely scrutinized because of the abortive mission to the ISS on Oct. 11, which ended two minutes after take-off when a rocket failure forced its two-man crew to perform an emergency landing. The crew repeatedly denied being nervous about flying and insisted the fact that the two-man crew had safely returned to Earth despite the dramatic mishap had demonstrated the reliability of the rocket’s safety mechanisms. Before take-off, an Orthodox priest at the launchpad on Sunday gave his blessing to the flight, splashing holy water from a brush and holding up a cross. The spacecraft is due to dock at the ISS at 1736 GMT on Monday.